Bold Ventures Intersects Gold-Bearing Zone at Black Phoenix- Lac Surprise Gold Property, Québec - Bold Ventures Inc.
Toronto, Ontario, March 9, 2017- Bold Ventures Inc. (TSX.V:BOL)(“Bold”) and Northern Superior Resources Inc. (TSX.V:SUP)(“Northern Superior”) are pleased to announce the results of the recent diamond drilling program at the Black Phoenix area within the Lac Surprise Property. An approximately 10 line-km Induced Polarization, (“IP”) and Magnetic survey over the Black Phoenix area of the property yielded four priority anomalous trends. This area of the property is also interpreted to be the source of one of three gold-in-till dispersal train(s). In addition, prospecting completed in the Black Phoenix area yielded a grab sample containing 19.9 g/t Au, (see Bold-Northern Superior news releases dated October 29, 2014 and October 20, 2016). The gold grain and gold geochemical train(s) and grab sample appear to be associated with structures that extend east off the Lac Surprise property onto the adjacent Vanstar Mining Resources Inc. (Vanstar) property. Vanstar reported elevated gold values in diamond drilling including a drill intersection of 10.34m grading 4.43 g/t Au (see Vanstar news release dated June 30, 2016). The Black Phoenix grid is located approximately 4 km west of the Nelligan gold discovery on the adjacent Vanstar property. In order to test the anomalies located by the IP survey described above, a drill program consisting of 5 drill holes and 1185 m has been completed. The results indicated that at least one of the anomalous trends is gold bearing and confirms that a hydrothermal gold bearing system exists. The elevated gold values that were encountered in Hole BP-17-04 and BP-17-05 occur on the most southerly IP trend in this locale. Hole BP-17-04 intersected two intensely altered, silicified and sericitized sedimentary horizons from 202 m to 224.72 m, and from 229.2 m to 247.56 m downhole. Pyrite was the only observed sulphide, and varied from 2-6% throughout the zones. The best intersection encountered was 6.34 metres of 1.12 g/t Au including 0.73 metres of 4.50 g/t Au within that interval. Hole BP-17-05 intersected a slightly less altered and mineralized zone from 75 m to 80.9 m, and again from 93 m to 96.72 m downhole. The zone from 75 m to 80.9 m was associated with mm to cm bands of up to 40% pyrite and minor quartz veins. 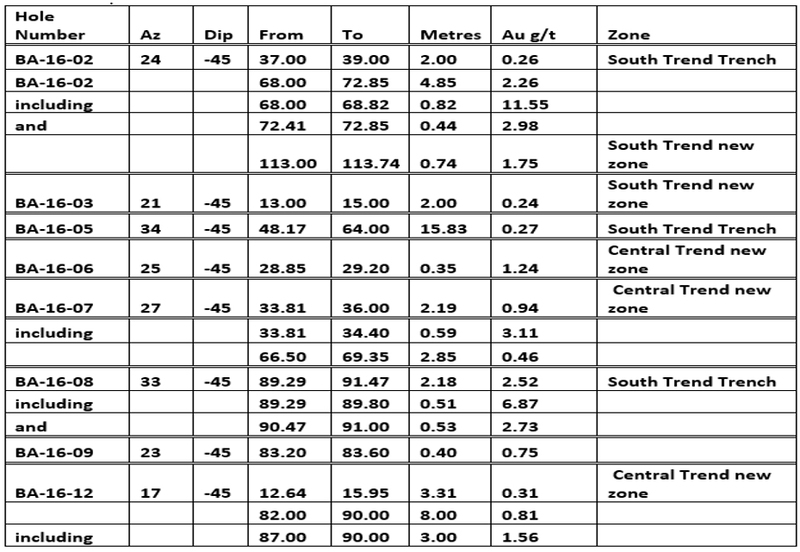 The zone from 93 m to 96.72 m was associated with bleaching, moderate deformation and minor quartz veining. Pyrite content was generally < 2%. The best values encountered in this hole were 5.9 metres of 0.62 g/t Au including 1.4 metres of 1.48 g/t Au within that interval. This IP anomaly is open to the west and east. Additional surveys are needed to determine if the anomalies extend beyond the current Black Phoenix IP survey limits. Link: Black Phoenix, Winter 2017, Drill Program and Regional Geology. Holes BP-17-01, BP-17-02 and BP-17-03 returned no significant assay values in gold. 3) the Black Phoenix area warrants additional drilling and IP surveys based on the favourable results received to date. See the table below for results. The Bold technical team is currently reviewing the project data base in order to prioritize the next phase of work. Drill targets within the Amber and Black Phoenix grids and the Fox gold showings are currently being considered. Geophysical (IP) surveys have been recommended to further extend the Amber and Black Phoenix gold bearing horizons to the east and to the west. Management is pleased that with the limited drilling carried out to date on both the Amber and Black Phoenix grids three new gold bearing trends that are associated with IP anomalies have been discovered. Two have been located at the Amber grid and one at the Black Phoenix grid. The anomalies and associated gold horizons remain open in all directions at both grids. A third anomalous IP trend at the Amber grid remains to be drill tested. The Fox and Fox North zones remain a high priority target. The spring 2016, 12 hole, 1700m diamond drilling program at the Amber area (located in the extreme south-east corner of the Lac Surprise property) was successful in identifying 2 new gold bearing structures in that area (see news release dated July 11, 2016). The Lac Surprise Property is under option from Northern Superior whereby Bold may earn a 50% interest in the property by expending an aggregate of $2,000,000 and issuing to Northern Superior a total of 350,000 common shares of Bold over a three year period. A further 10% interest may be earned if Bold delivers a positive feasibility study within 5 years of execution of the formal option agreement. Bold is the “Operator” of the project. Bold Ventures works in both Ontario and Québec. In Ontario, Bold and its subsidiary Rencore Resources Ltd. have extensive holdings comprised of over 18 claim groups in and around the Ring of Fire area of the James Bay Lowlands. The company has also earned a 10% carried interest in the Koper Lake Project centrally located within the Ring of Fire and directly adjacent to the Eagles Nest nickel-copper massive sulphide deposit currently in the permitting stage (see Bold news release dated October 14, 2016). Bold has the option to earn a 100% interest in the Wilcorp gold property (subject to a 1% NSR) located approximately 14 km east of the town of Atikokan in Northwestern Ontario. In Québec, Bold’s primary focus is on two projects. The Lac Surprise Project where Bold has the option to earn up to 60% from Northern Superior, is located in west central Québec, approximately 50 km (30miles) south of Chapais and within the historic Chibougamau -Chapais copper-gold camp. 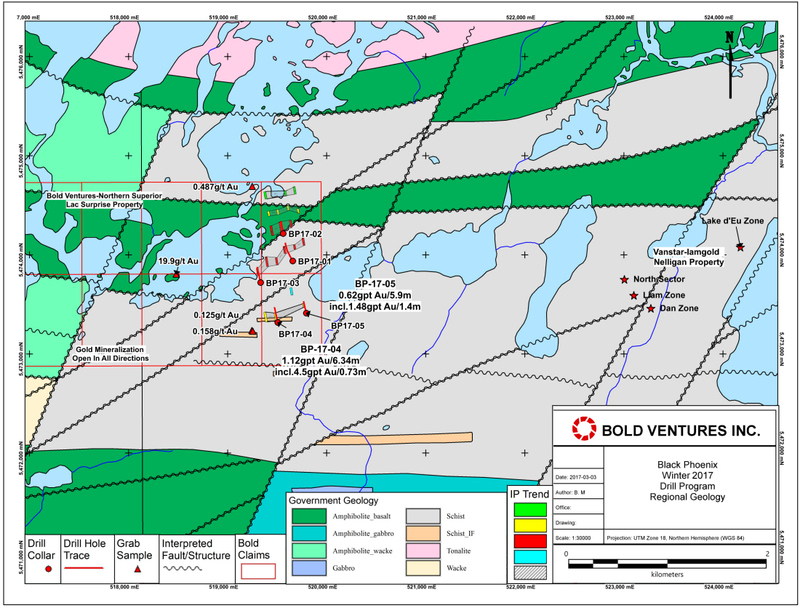 Bold is also exploring its 100% owned Lac Grasset Project that straddles the Sunday Lake Deformation Zone in the Matagami area, within the historically prolific Abitibi Greenstone belt of North-western Québec. Balmoral Resources Ltd. has seen success over the past few years in locating and expanding several gold and base metal discoveries proximal to the Sunday Lake Deformation Zone and has expanded its land position to surround Bold’s property (see Bold news release dated September 30, 2014). For more information please visit www.boldventuresinc.com, or contact Bold Ventures Inc. at 416-864-1456. Or Northern Superior Resources Inc. at www.nsuperior.com or 705-525-0992.